That makes Shell one of the few international oil and gas explorers venturing into China’s shale oil sector, and follows the Anglo-Dutch company’s exit from shale gas drilling in Sichuan province in the southwest after spending at least $1 billion (766.22 million pounds) and getting unsatisfactory results. Even as China asserted on Thursday that the ‘Wuhan Spirit’ was still on, there is a sense of betrayal in New Delhi over Beijing’s decision to stand by its ‘all-weather friend’ Pakistan by blocking the designation of JeM chief Masood Azhar as a global terrorist by the UN Security Council. The bonhomie witnessed between India and China over the last one year after the informal summit between Prime Minister Narendra Modi and Chinese President Xi Jinping in Wuhan April last year has clearly evaporated following the Chinese action. Amid the growing clamour in India for boycotting China after it used its veto power to block listing of Masood Azhar as a global terrorist, New Delhi has expressed disappointment over Beijing’s move while reaffirming its determination to pursue all avenues to bring the JeM chief to justice for terror attacks in different parts of India. A number of reasons, including the significant role Pakistan plays in China’s ties with the Islamic world and Beijing’s anxiety over spill-over effect of a ban on Azhar in China’s own restive Muslim-dominated Xinjiang region, could have played a role in Beijing deciding to yet again stonewall any action by the UNSC against the JeM chief, observers say. Despite its burgeoning trade relationship with India, China has never hidden the fact that it needed Pakistan more than any other country for achieving its geo-strategic goals in the region. Pakistan’s importance for China has increased manifold in recent years in view of the heavy economic and manpower investments it has made in the China-Pakistan Economic Corridor (CPEC) as part of President Xi’s signature Belt and Road Initiative (BRI). Sources said it was quite clear to New Delhi over the past few days that China was adopting double standards in the global fight against terrorism only to shield Pakistan. China, they said, could no longer take shelter under ‘lame excuses’ like India had not provided any ‘updated material’ on Azhar’s terrorist activities in India which could compel Beijing to reconsider its position on the JeM chief. Sources pointed out that India had submitted to China and other key nations ‘clinching and irrefutable’ evidence linking JeM to terror attacks in India, including the Pulwama attack. All other members of the UNSC, including those in the non-permanent category, solidly backed India’s effort to get the JeM chief banned but China put a spanner in their works yet again, they regretted. The US, meanwhile, said responsible UNSC members might be forced to other actions at the Security Council if Beijing continued to block Masood’s designation. China’s veto against banning Masood Azhar has once again highlighted the deep-rooted suspicion and mistrust between India and China on strategic issues, particularly the fight against terrorism. Despite pledging to work with India in combating terror, China has done precious little to assuage India’s concerns over terrorism emanating from Pakistan. China has, in fact, praised Pakistan on many occasions for its role in the global war against terrorism. Beijing’s contention has been that Pakistan itself has been one of the main victims of terrorism and it must be supported in combating the menace. There is also a feeling in Chinese circles that the situation in Jammu and Kashmir is the prime reason for terrorism in India. The argument being advanced by them is that while Kashmir is a disputed territory, Xinjiang is a province of China and, therefore, a comparison can not be drawn between the two regions. URUMQI, March 2 (Xinhua) — Farmers at a small village in western Xinjiang hardly had any days off this winter. Production at a walnut processing factory is going full throttle to meet demand. Yusup Tursun and his wife are walnut farmers in Kupchi Village in Yecheng County on the edge of the Taklimakan Desert. The couple has been hired by a new walnut processing facility in the village, with the husband a quality inspector and his wife working part-time cracking nuts. As a main base for walnut production, Yecheng has over 38,000 hectares of high-quality thin-shell walnut groves. “It used to be quite difficult to sell the walnuts. The factories, with so many products, have made it easier for the sales,” Yusup said. Seven companies make products from the nuts — walnut milk, walnut candies and edible oil. The shells are made into coloring agent and pollutant-absorbing carbon. Diversity in the walnut products pushed the industry output to a new high of 2 billion yuan (about 299 million U.S. dollars). Three in every five people work in the walnut industry in Yecheng, where 550,000 people live. Across Xinjiang, processing facilities are established to add value to agricultural products. 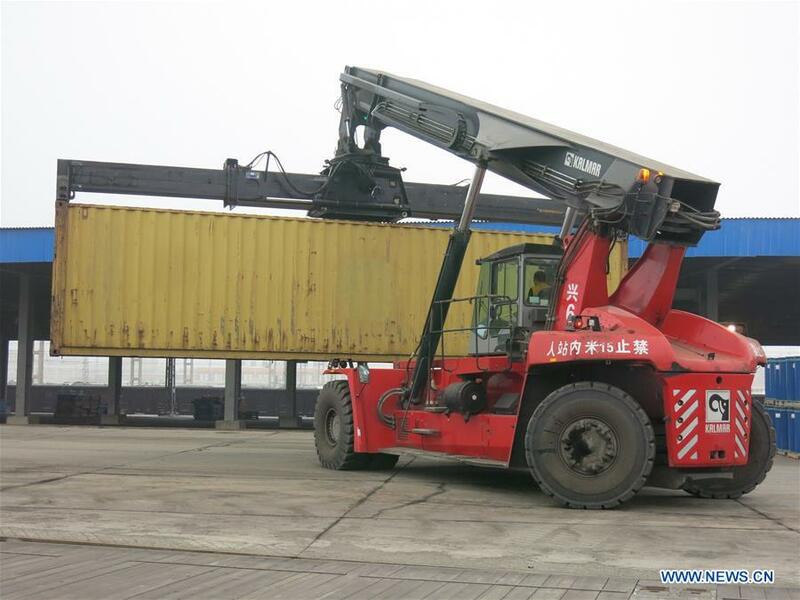 Transport and logistical services are improved to boost the sales of Xinjiang’s signature agricultural products such as Hami melons, Korla pears and Turpan grapes. Xinjiang is also moving up the value chain in two of its traditional industries — cotton and coal. As one of the main cotton production bases in China, Xinjiang holds sway in the textile industry. By making full use of its cotton resources and geographical advantages as a portal for opening up, the region no longer sees itself as just a production base for raw materials. Starting from 2014, China’s leading garment and apparel makers including Ruyi Group, HoDo Group, and Huafu Fashion Co. Ltd invested in the region and built factories. These factories have produced added benefits and created jobs for the local people. Xinjiang produces 1.5 million tons of yarn and over 40 million ready-made garments every year. More than 400,000 people work in the industry. In the eastern part of the coal-rich Junggar Basin, workers have found that the snow is cleaner than before. The Zhundong Economic Technological Development Park, about 200 km west of Urumqi, is home to China’s largest coal field. A stringent environmental requirement is applied to the park, said Ren Jianpin, director of the management committee of the park. Coal enterprises are required to control coal dust, install equipment to recycle water and coal slags are processed into construction materials, he said. The park is focused on boosting high-end industries in aluminum and silicon materials, which generate more value and have less impact on the environment, he said. Last year, a large-scale bio-based plant went into operation in Usu City to turn corn into nylon. The Cathay Industrial Biotech, a Shanghai-based biotech company, is the investor. Nylon is usually made from petroleum, and the use of crops such as corn and wheat to make recyclable and environment-friendly nylon has promising business prospects, said Wang Hongbo, vice general manager of the company’s Usu branch. The Usu branch will have an annual output of 100,000 tons of bio-based polyamide, and it is expected to boost the development of downstream industries in the future, he said. The oil-rich city of Karamay has also received a hi-tech boost as cloud computing firms eye the dry and cold weather in the area. Karamay is home to many key state-level projects and IT-industry leaders, including a global cloud service data center for Huawei, data centers for the China National Petroleum Corp. (CNPC) and China Mobile. Xinjiang is making new breakthroughs in precision machining, new materials, manufacturing and textiles. Data from the regional statistics bureau show that the value added of the hi-tech manufacturing in Xinjiang rose by 32.1 percent year-on-year in 2018. As a core area on the Silk Road Economic Belt, Xinjiang has maintained solid growth momentum in foreign trade. Foreign trade volume between Xinjiang and 36 countries and regions along the Belt and Road (B&R) totaled about 291.5 billion yuan (43.5 billion U.S. dollars) in 2018, up 13.5 percent year on year. Economic observers say that there is still much room for Xinjiang to scale up its processing trade to raise the level of imports and exports. Xinjiang will further develop an export-oriented economy in 2019 and participate in economic exchanges with neighboring countries, according to the regional government’s work report released in January. ANKARA (Reuters) – Turkey risks jeopardising economic ties with China if it keeps criticising Beijing’s treatment of Uighur Muslims, China’s envoy to Ankara warned, just as Chinese firms are looking to invest in Turkish energy and infrastructure mega-projects. Last month Turkey broke a long silence over the fate of China’s Uighurs, saying more than one million people faced arbitrary arrest, torture and political brainwashing in Chinese internment camps in the country’s northwestern Xinjiang region. Turkey’s Foreign Minister Mevlut Cavusoglu repeated Ankara’s concern at a United Nations meeting this week, calling on China to respect human rights and freedom of religion. China has denied accusations of mistreatment and deems criticism at the United Nations to be interference in its sovereignty. Beijing says the camps are re-education and training facilities that have stopped attacks previously blamed on Islamist militants and separatists. “There may be disagreements or misunderstandings between friends but we should solve them through dialogue. Criticising your friend publicly everywhere is not a constructive approach,” said Deng Li, Beijing’s top diplomat to Ankara. “If you choose a non-constructive path, it will negatively affect mutual trust and understanding and will be reflected in commercial and economic relations,” Deng, speaking through a translator, told Reuters in interview. For now, Deng said that many Chinese companies were looking for investment opportunities in Turkey including the third nuclear power plant Ankara wants to build. Several Chinese firms including tech giant Alibaba, are actively looking at opportunities in Turkey after the lira’s sell-off has made local assets cheaper. In addition to Alibaba, which last year purchased Turkish online retailer Trendyol, other companies holding talks included China Life Insurance and conglomerate China Merchants Group, Deng said. Deng said Chinese banks wanted to invest in Turkey, following the lead of Industrial and Commercial Bank of China (ICBC) which bought Tekstilbank in 2015. Chinese investment in Turkey would help narrow Ankara’s gaping current account deficit, which stood at $27.6 billion last year. Turkey’s trade deficit with China alone stood at $17.8 billion last year, according to Trade Ministry data. In January, Turkey’s Finance Minister Berat Albayrak said it was “impossible” for Turkey to maintain such a trade deficit with China and other Asian countries, saying the government was considering taking measures. Deng said he did not expect Turkey to take protectionist steps. “Both countries are strictly against such policies, and both economies need an open world economy,” he said. He also called on Turkey to adopt Chinese payment platforms such as WeChat and AliPay. “People don’t want to pay in cash and the population here is very young so they wouldn’t have trouble adapting to new technologies,” Deng said. Good diplomatic and political ties, however, would remain crucial for developing economic ties and attracting more Chinese investment, he said, adding that he had raised the issue with Cavusoglu on Tuesday, a day after the foreign minister’s intervention at the United Nations. “The most important issue between countries are mutual respect,” he said. “Would you stay friends if your friend criticized you publicly every day? 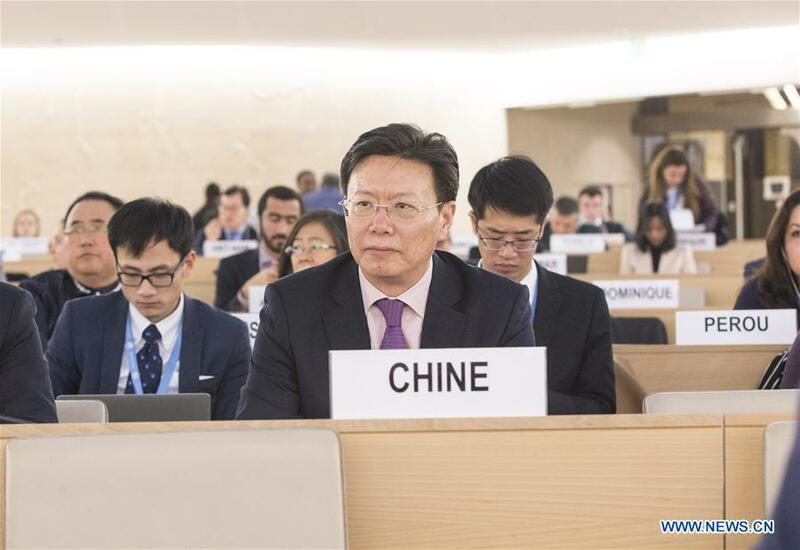 GENEVA, Feb. 27 (Xinhua) — The 56 ethnic groups in China, living together like brothers and sisters, are all part of the big family of the Chinese nation, a Chinese envoy said Wednesday at the ongoing UN Human Rights Council (UNHRC) session in Geneva. “The people of all ethnic groups are tightly held together like pomegranate seeds, and together they are making arduous efforts for the great rejuvenation of the Chinese nation where they can all live a happy life,” said Yu Jianhua, head of the Chinese Mission to the UN Office at Geneva, when elaborating on China’s human rights propositions and expounding achievements of the human rights undertakings in Xinjiang Uygur Autonomous Region in northwestern China, during the UNHRC’s 40th session. Yu said that as unilateralism and protectionism are on the rise in today’s world, coupled with the still outstanding problem of unbalanced, uncoordinated and unsustainable development, it’s particularly important for countries to firmly practise multilateralism and to jointly build a community with a shared future for mankind. To that end, Yu put forward China’s propositions on advancing undertakings for human rights internationally. Firstly, mutual respect should be taken as a premise, by which all countries should respect their peoples’ choice of development path for human rights. Secondly, all countries should adhere to the principle of fairness and justice, abide by the purposes and principles of the UN Charter, respect the sovereignty and territorial integrity of each country, and oppose interference into other countries’ internal affairs under the pretext of human rights. Thirdly, all countries should aim for win-win results through cooperation; and lastly, all countries should champion a people-centered vision and promote human rights through development. On the topic concerning China’s Xinjiang Uygur Autonomous Region, the Chinese ambassador said that the stance adopted by some countries is biased and entirely based on misjudgment, which runs counter to facts. He said that the Chinese government has adopted a series of anti-terrorism and de-extremization measures in Xinjiang, including the establishment of vocational training facilities, which aim to help the few people who have been influenced by extremism to get rid of their terrorist and extremist thoughts and reintegrate them into the society as soon as possible. These measures, carried out in full accordance with the law, have greatly improved the security situation in Xinjiang and effectively safeguarded the human rights of the people of all ethnic groups and thus received sincere support from the people, Yu said. BEIJING, Feb. 26 (Xinhua) — China had over 2.9 million teachers in rural areas by the end of 2018, the Ministry of Education said Tuesday. Close to 2.5 million rural teachers work at primary and secondary schools, while 420,000 teachers work at kindergartens, according to the ministry. The ministry is striving to build a high-quality team of rural teachers and dispatched a great number of college graduates to the rural areas, especially the poverty-stricken regions, said Liu Jiantong, an official with the ministry’s department of teachers. The central budget financed 4.5 billion yuan (670 million U.S. dollars) last year as an allowance for 1.27 million teachers from over 80,000 rural schools in China’s central and western regions, said Liu. In 2018, 1,800 retired teachers in good health registered to teach at rural schools. In addition, 19 provincial-level regions dispatched 4,000 teachers to support education in Tibet and Xinjiang, said the ministry. China’s wealthiest regions also have the largest number of untrustworthy businesses, according to the government’s social credit system, which rates citizens and companies based on their behaviour. Jiangsu, the country’s second largest provincial economy – 9.26 trillion yuan (US$1.37 trillion) – accounted for 16.7 per cent of the discredited businesses that were added to the national blacklist last year, more than any other region. According to a report compiled by the National Public Credit Information Centre that is backed by China’s state planner, the National Development and Reform Commission, Guangdong is next in line. Guangdong is China’s most prosperous province, Guangdong, but is also home to 12.77 per cent of the total 3.59 million blacklisted firms. The southern province had a gross domestic product of 9.73 trillion yuan last year. In third spot was Zhejiang, the prosperous province just south of Shanghai, while the capital city of Beijing was ranked fifth. These places together contributed slightly more than 30 per cent of China’s gross domestic product (GDP) last year. By naming and shaming the millions of Chinese businesses and individuals on the annual blacklist, Beijing hopes to boost “trustworthiness” in Chinese society. Under the system, each of its 1.4 billion citizens is expected to receive a personal trustworthiness score. “In more developed coastal provinces, businesses have long operated in the grey area between emerging China and established Hong Kong,” said Brock Silvers, managing director of Kaiyuan Capital, a Shanghai-based financial advisory firm. Silvers said the situation evoked the Chinese saying: “Heaven is high and the Emperor is far away”, which alludes to local officials’ tendency to disregard central government’s directives. While it was previously not such a faux pas to engage in “untrustworthy” behaviour in attaining economic development, things are now different. “The ability to cut corners in search of profit isn’t as prized in China’s modern economy, and many of those old traits can now lead companies to be added to Beijing’s blacklist,” Silvers said. Among the firms named in the hall of shame is Chuangyue Energy Group, from northwest Xinjiang, which topped the list of new cases involving at least 500 million yuan in fraudulent activity. Chuangyue and its legal representative Qin Yong were reprimanded by the Shenzhen Stock Exchange in 2016 for failing to disclose transactions on time. The transaction involved changes to the shareholding structure of a listed firm in which Chuangyue held interest in, state media reported. Also on the list was property developer Zhonghong Holding, which was delisted from the Shenzhen exchange late-last year after its shares fell below the par value of 1 yuan for 20 consecutive days. Zhonghong had posted massive losses, failed to repay loans and halted development projects during 2018. A typical area of fraud cited in the report was bogus advertising, with the biggest number of discredited companies located Shanghai, China’s most commercial city. Property brokerage was a hotbed industry for fraudsters. The report named and shamed two agents in Wuhan, An Yi Real Estate Brokerage and Hong Run De Real Estate Brokerage, which Chinese netizens described as “black brokers”. In one case, Hong Run De subdivided one flat to lease without the owner’s knowledge and consent. To terminate the contract, the owner had to pay “compensation” of 30,000 yuan before they could reclaim the flat. Other dodgy sectors were health care product makers and peer-to-peer (P2P) lending platforms. Quanjian Group, a maker of herbal medicines, was accused of making false marketing claims about the benefits of a product that a four-year-old cancer patient drank. Changsheng Bio-Technology, the major Chinese manufacturer of rabies vaccines, was fined US$1.3 billion in October after it was found to have fabricated records. A total of 1,282 P2P operators, more than half located in Zhejiang, Guangdong and Shanghai, were placed on the blacklist because they could not repay investors, or were involved in illegal fundraising. While more individuals and companies were added to the blacklist, others were also removed – 2.17 million. Those removed had paid taxes owed or fines imposed. Pakistan’s multinational naval drill involving 46 nations has wrapped up in the Indian Ocean and, once again, India was not invited. 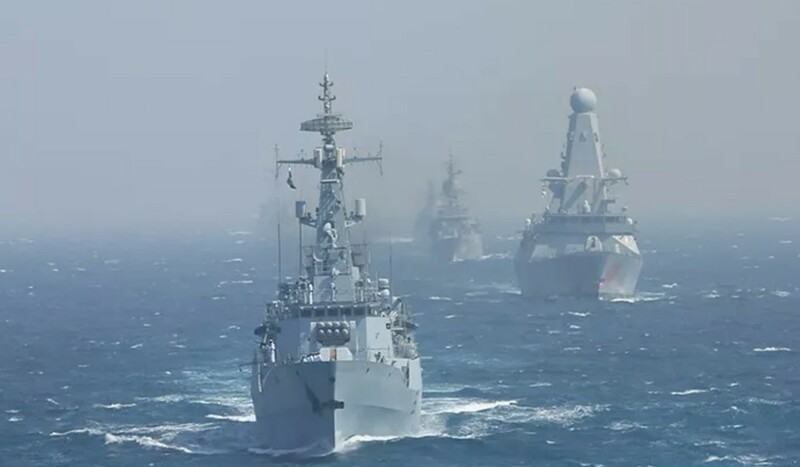 The Pakistan Navy has hosted the Aman – which means “peace” – exercises every two years since 2007 to promote regional cooperation and stability. India has never been invited, in a sign of the long history of strained ties between the neighbours. China, Japan and the United States were among the countries taking part in Aman-19, from February 8 to 12, which included maritime conferences, seminars and cross-ship visits, as well as 23 sea operations with main-gun firing, formation movement and replenishment-at-sea. Shao Shuguang, commander of the People’s Liberation Army Navy’s 998 Fleet, was quoted on a Chinese military social media account as saying the exercise had strengthened mutual understanding and trust between the participating navies. China sent one of its biggest warships, the Kunlun Shan amphibious landing vessel, to the exercise, signalling its close relationship with Pakistan and the key role both nations hold in the Indian Ocean, according to analysts. “The Pakistan-China relationship is very strong, and this is one more illustration of the strength of the Pakistan-China relationship,” said Madhav Das Nalapat, honorary director of the department of geopolitics and international relations at Manipal University in India. “China is also now becoming an important maritime power, especially in the Indo-Pacific. By aligning with China, Pakistan hopes to get the synergy of that. Tridivesh Singh Maini, assistant professor with the Jindal School of International Affairs in India, said the exercises should be a cause for alarm for India. “They will keep an eye on what’s going on, but they don’t need to be too concerned,” he said. The military exercise also centred on maritime security to protect strategic economic projects such as the China-Pakistan Economic Corridor, as well as sea lanes from the Persian Gulf. The US$62 billion China-Pakistan Economic Corridor (CPEC) is designed to connect China’s far west region of Xinjiang with Gwadar Port in Pakistan via a network of motorways, railways, oil pipelines and trading hubs. The project is expected to be finished by 2030, and will provide China with an important trading route to the Middle East and Africa. “India has very strenuously objected to the name CPEC being given to the part that goes through Pakistan-occupied Kashmir, but so far nothing has been done,” Nalapat said. Kashmir has long been a hotbed for competing territorial claims between India and Pakistan. The two countries have fought three wars against each other since their independence from Britain in 1947, and two of those conflicts have centred on the Kashmir territorial dispute.